Find artworks, auction results, sale prices and pictures of Marten De Vos at auctions worldwide. 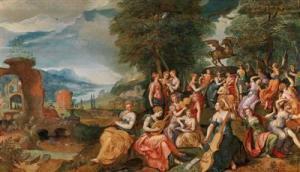 Maarten de Vos (Antwerp 1532–1603) The Contest between the Muses and the Pierides (based on Ovid, Metamorphoses, V: 294–317), oil on panel, 77 x 135 cm, framed Exhibited: Athens, National Gallery, Alexandros Soutzos Museum and Netherlands Institute, Greek Gods and Heroes in the Age of Rubens and Rembrandt, September 2000 – January 2001; and Dordrecht, Dordrechts Museum, February – May 2001, no. 85 The contest between the Muses and the Pierides depicted here is described in Ovid’’’’’’’’s Metamorphoses. The nine strong-voiced daughters of the Macedonian King Pieros, called “Pierides”, challenged the nine Muses, daughters of Zeus, father of the gods, in a singing contest. The judgement was to be made by a jury of nymphs, who eventually decided in favour of the Muses. When it was her turn, the very first Pieride offended Mount Olympus in a song about the cowardly deeds of the gods. This hubris displayed by a mortal was punished, as is frequently the case in ancient mythology. The nine sisters were deprived of their human bodies and transformed into magpies. 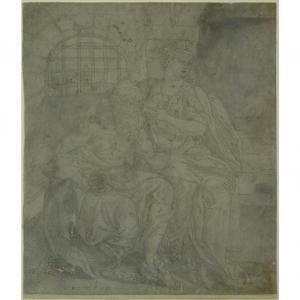 The scene was rarely depicted in the sixteenth and seventeenth centuries. Maarten de Vos was one among few Flemish artists who painted the subject. Maarten de Vos began his career as a student of Frans Floris. In 1552 he travelled to Italy. He visited Rome and Florence and finally settled in Venice, where he entered the workshop of Tintoretto, and became his assistant and friend. He supplied the landscape backgrounds for some of his master’’’’’’’’s compositions. His style combined Mannerist and realistic elements. In 1558, de Vos returned to Antwerp, where he became one of the town’’’’’’’’s leading Italianates. Numerous altarpieces in the churches of Antwerp attest to his prolific activity. 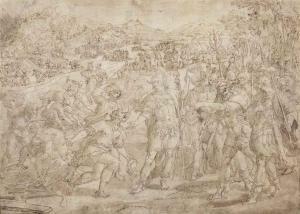 Maerten de Vos (Antwerp 1532-1603) A scene from the life of Alexander the Great pen and brown ink, brown wash, fragmentary brown ink framing lines 27 x 37.5 cm. Armand Sigwalt (1875-1952) (according to a note in the collection files). Paul Brandt (1900-1984), his mount; from whom purchased by I.Q. 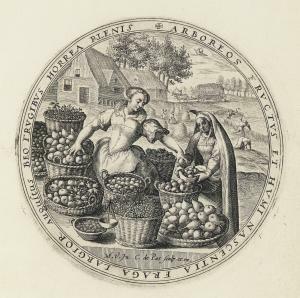 van Regteren Altena. Hinged to the back mat along the upper margin. Laid down to a second sheet of paper and hinged to the back mat. Scattered stains. A few losses of paper, particularly in the lower left quadrant. Nicks around the edges. Scattered scuffs and staining. Small hole in prison wall in the upper left quadrant. Area of staining on Cimon's lap. Foxing. [LES MOIS DE L'ANNÉE. 12 GRAVURES AU BURIN DE CRISPIN DE PASSE.] VERS 1580-1626. 12 feuillets in-8 (237 x 159) portant 12 gravures circulaires (diam. : 121 mm), sous Marie-Louise. Chemise moderne demi-maroquin et vélin, et étui. Sans le très rare titre, également gravé en rond. des douze mois, gravée par Crispin de Passe (1564-1637) d'après les oeuvres de Marteen de Vos (1532-1603). Sans le très rare titre, également gravé en rond. "In response to your inquiry, we are pleased to provide you with a general report of the condition of the property described above. Since we are not professional conservators or restorers, we urge you to consult with a restorer or conservator of your choice who will be better able to provide a detailed, professional report. Prospective buyers should inspect each lot to satisfy themselves as to condition and must understand that any statement made by Sotheby's is merely a subjective, qualified opinion. Prospective buyers should also refer to any Important Notices regarding this sale, which are printed in the Sale Catalogue. NOTWITHSTANDING THIS REPORT OR ANY DISCUSSIONS CONCERNING A LOT, ALL LOTS ARE OFFERED AND SOLD AS IS" IN ACCORDANCE WITH THE CONDITIONS OF BUSINESS PRINTED IN THE SALE CATALOGUE."